Is LottoRoyals a Scam or Legit? Read Reviews! LottoRoyals Exposed — Will You Bet on Lotteries Here? What does 24 hours of the day, 365 days of the year mean to you? I was looking at LottoRoyals.com and noted this claim in their contact information. After taking a look at what this online lottery betting provider offered, I had a heap of questions. I tried to call and didn’t want to leave a message. I sent an email and am still waiting for the answer. Let me explain about my questions. 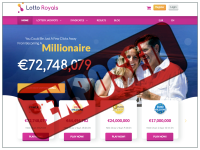 At Lotto Royals, players can bet on officially published lotteries including US Powerball and Mega Millions, EuroJackpot and EuroMillions, Mega-Sena, SuperEnaLotto, 6aus49, BonoLoto, Irish Lotto, Oz Lotto, NZ and Aussie Powerball. Players have the options of playing single ticket lines or more, multiple draw with discounts (4/4%, 8/10% and 26/15%) or choosing a subscription. Oh, and as a welcome bonus, your first bet is free. LottoRoyals.com offers 6 syndicates including Atlantic Pack (EuroMillion, EuroJackpot, US Powerball & Mega Millions), Big USA (Powerball & Mega Millions), Euro Zone, Kiwi Ozi (Oz Powerball, NZ Powerball & Oz Lotto) Hot Latin (SuperEnaLotto, Mega-Sena & BonoLoto) and Daily Global (US Powerball & Mega Millions, EuroMillions & EuroJackpot, BonoLoto, & German Lotto). Each syndicate has 170 shares for a minimum of 4 draws. But here’s where I got confused. Looking at the ticket lines posted versus the list of actual ticket lines, the number does not compute. It didn’t seem to matter how I calculated each syndicate option, I came up with different numbers from what Lotto Royals states. What gives? Remember this is a betting site and not a place where you’ll have your own tickets. LottoRoyals.com says that insure winnings but they don’t provide the name of the insurer. Winnings are credited directly to your account though in some cases on bigger wins, it might involve additional documentation to get it. There is a minimum of €50 for any withdrawal. LottoRoyals.com is operated by a company registered in London but licensed by Curaçao. There is a snail mail address in the UK, email address, phone number and online form. There is an answering machine on the phone number where you can leave a message though it seems operators are always busy. Okay, then suddenly it rings and rings with no answer. Lotto Royals also automatically confirms enquiries by email though not sure how long it takes to get an answer. There is also a pop up message on the site “Leave a Message” which sort of suggests they have online chat though again, there doesn’t seem to be anyone there. The only information on customer service hours is that they are available 24/7, 365 days of the year – NOT. Reading through the terms and conditions, there is only information on six lotteries including Loteria de Navidad. That was a little strange. They also explain a way to play Lotto 6aus49 including Spiel 77, Super 6 and Glucksspirale – which is actually not available on their site. Oh and if you do win the jackpot for MegaMillions, you’ll have to accept the annuity –not a full payout. Besides the usual being of legal age in your country (usually 18 or older), players cannot be “located” in a country where it lottery betting is illegal. Players also can’t be a resident of Afghanistan, China, Cuba, Hong Kong, Iran, Israel, Myanmar, North Korea, Singapore or Turkey. You’ve also got to register as yourself (versus for a 3rd party) and can only have one account. Would you mind rating LottoRoyals.com? I am still a little twitchy about the whole betting idea re lotteries. I’d feel a lot more confident if Lotto Royals posted who the insurer was who you’d get that jackpot win through. Add to this, the fact that the terms and conditions don’t actually seem to be written for this site. LottoRoyals.com gets a thumb’s down. The bottom line for me is if you’re going to say your communication is “24 hours of the day 365 days of the year”, that means you’re available immediately.